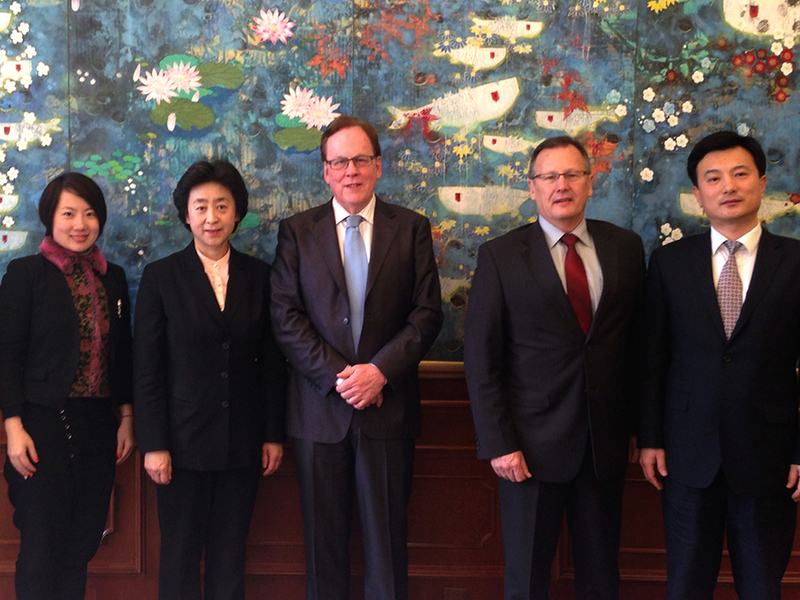 CHINA READY directors were honored to have been hosted at the magnificent Chinese Government official State Guesthouse in Beijing during their recent visit to the city. Built on the site of the ancient Diaoyutai beauty spot with a history dating back more than 800 years, the enormous complex was constructed in 1958 to host visiting heads of State and Government invited to take part in the 10th Anniversary of the founding of the People’s Republic of China. It has since hosted more than 1200 foreign heads of State and Government. Located in the heart of Beijing and known as Diaoyutai State Guest House, the garden style high security compound covers a total area of 430,000 square meters, including 51,000 square meters of lake and 250,000 square meters of lawns and gardens. The facility is made up of 16 new villas and two ancient architectural complexes constructed around a central lake. It had been snowing the day before the CHINA READY directors arrived so the contrast between the ice, snow and a clear blue sky was dramatic. The distinct villas and ancient architectural complexes are located around a central lake which creates the feeling of being in “another place and another time” – in a world very different from the normal experience of the city of Beijing. Diaoyutai has become a key venue for Chinese leaders to conduct state and diplomatic activities. It is now internationally renowned for its unique State-Banquet style cuisine, elegant and thoughtful service and top-grade imperial gardens, richly endowed with history and culture. With 50-years’ of practice, innovation and development, it has created its own “tasty and healthy” cooking style called “Diaoyutai Cuisine” . Diaoyutai Cuisine blends the best of Chinese cuisine with the best of other cuisines from across the globe. Diaoyutai chefs and service staff are the very best in China and the crockery, cutlery and furnishings are unique to the property. There are ancient stories attached to almost every aspect of Diaoyutai creating a unique and memorable experience which has become famous amongst those Chinese and foreign guests lucky enough to have been hosted there. Photographs are not permitted for security reasons, however having said that, CHINA READY was fortunate in being allowed to take a few shots which convey a little of the majesty and history of this magnificent facility.